What’s It About? Cloverfield director Matt Reeves helms this sequel to 2011’s Rise of the Planet of the Apes, which takes place ten years later. Times are desperate for the remaining humans, but when they stumble across Caesar’s group of apes, things escalate and a war between the two seems likely. 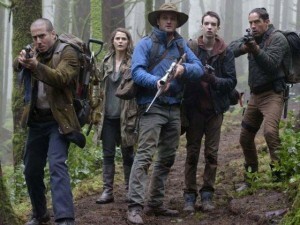 The Verdict: Rise of the Planet of the Apes was a surprise hit, adding a bit of pressure to this follow-up. Starring James Franco and Freida Pinto, the humans were the main characters, but it was Andy Serkis’ excellent work as Caesar that made the film work. What Reeves delivers here in Dawn of the Planet of the Apes is a very confident film. Though the humans are interesting characters and give good performances, this really is about the apes. Serkis continues his incredible performance-capture work here as Caesar, and this is arguably the best performance of this kind. Caesar is a brilliant film character, one to route for, with so much emotion in his eyes alone. But the focus isn’t all on Caesar. Far from being a generic CGI-group of extras, many of the other apes have real personalities too. 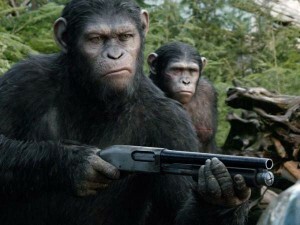 Toby Kebbell is every bit as brilliant as Koba, the aggressive number 2 ape. Like Barnes and Elias from Platoon, they are ostensibly on the same side, but you can feel the tension bubbling under the surface. 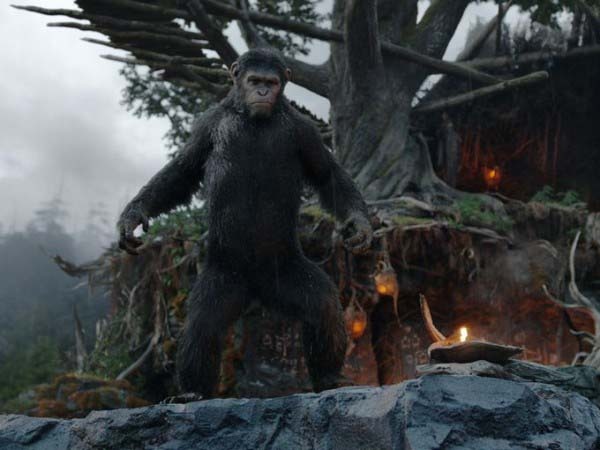 Koba is menacing and scary throughout, but Kebbell’s physical performance shines through when he acts ‘ape-like’ to trick humans – to great comic effect. It’s hard not to think of another great villain, The Lion King’s Scar, whilst watching him – the scars he received at the hands of humans in the first film making him look far more intimidating than the other apes (and some plot points in the film echo The Lion King too). There are other standouts amongst the apes, including Caesar’s son, Blue Eyes (Nick Thurston), conflicted between following the considered approach of his father or Koba’s more aggressive stance. He again conveys so much through his body language and eyes. Maurice, the large orangutan who acts as a teacher to the group, is difficult not to root for. The apes have come a long way since the last film. As well as great ape performances, the human leads need to engage as well – something people levelled as a criticism against Godzilla earlier this year. Jason Clarke is Malcolm, the man who sees the good in the apes. His relationship with Caesar is nice to watch, and he puts in a good performance. Kodi Smit-McPhee, as his son, is also great – and it’s through him we get to see Charles Burns’ graphic novel Black Hole on screen, which is sure to give anyone who’s read it a pang of excitement. Gary Oldman is reliable as ever, and Keri Russell is the leading lady, but isn’t really given very much to do. It is a slight criticism of the film that the women are largely sidelined whilst the men talk or fight it out. Michael Giacchino provides an epic score throughout, including a great sense of doom when Koba is acting out. The sets are magnificent. The apes’ large village is constructed almost entirely of branches and woodland, and the humans’ base and deserted city landscape is like something straight out of post-apocalyptic game The Last Of Us. Dawn is serious, with something to say for itself, but not at the expense of a lack of action. Unlike many blockbusters in recent years, it isn’t a case of explosions for explosions’ sake – it is a very well thought-out, well written movie, that happens to have great action sequences (and at least one visual Donkey Kong reference to boot). It explores issues of diplomacy and leadership; but if apes riding horses whilst firing guns is your thing, you’re also in luck. Final Words: It’s hard to compare recent films to the massive blockbusters of the late 1980s and early 1990s as computer technology has improved so much. We can now believably see things on screen that wouldn’t have been possible before, but that can mean we get films with great special effects instead of a good, well written story. Dawn of the Planet of the Apes, perhaps better than any other blockbuster in recent years, creates the perfect balance of action, emotion and story-telling. It is a serious movie, but also has more than enough for the average cinema-goer to enjoy. 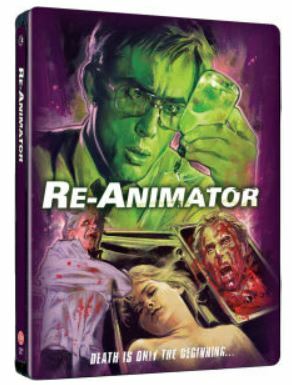 In fact, it has everything that makes a truly great blockbuster, and a truly great film. Dawn of the Planet of the Apes is out in UK cinemas on 17 July 2014.